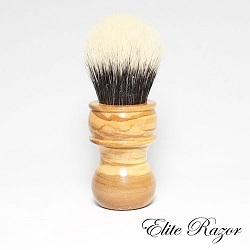 Olive wood is one of my favorite woods, and Bob Quinn's (Elite Razor) E7 is one of my favorite custom handle deigns. I asked Bob to make me an E7 for a 26mm TGN Finest, and to set the knot at 50mm. I also asked that the wood be crosscut, so that the lines run horizontally, instead of vertically. The result is this beautiful brush. The first picture is Bob's, before the knot was set. The second picture is mine, after the brush had one shave. This E7 handle is about 60.30mm tall. The knot measures 27.60mm at the base of the handle. The new knot was pointy, even more so than is apparent in Bob's picture. This concerned me because I don't care for the feel of pointy bulb knots. However, after just one shave the knot relaxed, opened up, and settled into a nice bulb shape. The knot is excellent, with the usual TGN Finest backbone and soft tips, with no scritch. My only other wood brush is an SOC boar and I've always been concerned about how well wood brushes hold up to the regular soaking they get. Bob told me he finishes his wood brushes with a sealant designed for wood decks on sailboats, so this beautiful brush should hold up well. I agree that they are stunning. I recall that you have a number of them. 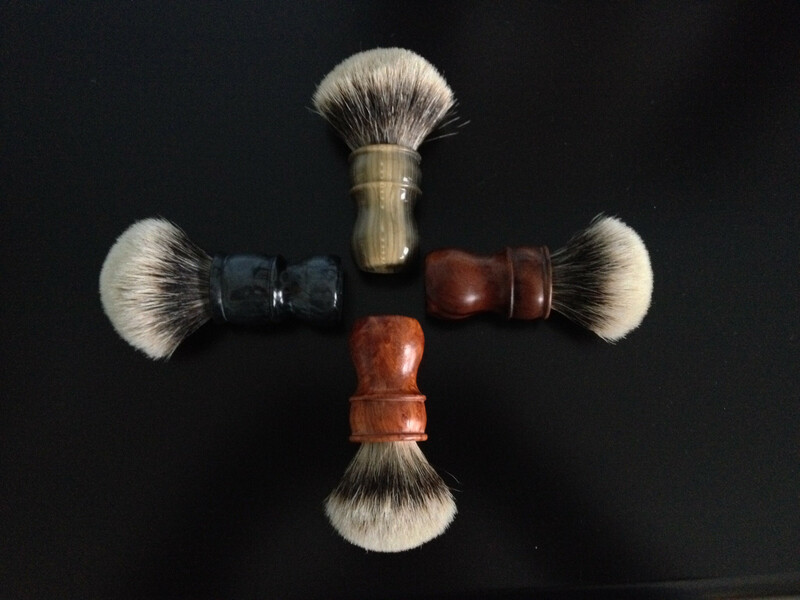 I have some with both TGN and WSP 2-band knots and they are among my favorite custom brushes. Beautiful brushes...both of you guys. Olivewood is indeed a beautiful material! Lovely brush! 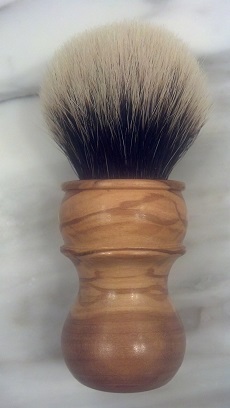 The olive crosscut is a beautiful brush. Your decision to have it turned with the grain as opposed to the traditional across the grain was brilliant. It took an already beautiful brush style to a whole other level. Congrats on your ingenuity and your gorgeous new brush. (04-04-2014, 07:01 PM)W.S.O. Wrote: Your decision to have it turned with the grain as opposed to the traditional across the grain was brilliant. It took an already beautiful brush style to a whole other level. Congrats on your ingenuity and your gorgeous new brush. The idea for the crosscut was Bob's. I do agree it gives the handle a unique look. Well done, Ricardo and Bob! That crosscut is interesting, Looks nice!